Silly is located just 40 kilometres to the south-west of Brussels in a rural part of the Hainaut province. It is a region that is well worth discovering. Hikers wanting to step a little off the beaten path in search of peace and quiet can explore this lovely area and visit the Silly craft brewery all in one day. Silly is proud of its rich heritage: churches, castles, chapels, niches with holy statues, historic boundary markers, stocks and pillories, the characteristic old houses and large farmhouses. Hiking trails and cycling tracks, some of them cross -country, take you along alleyways, paths, forest tracks and country roads all in a splendid landscape. There are several marked trails and you can also hire a guide to discover this region. The Musical Spring is just one local event, a classical music festival that has been staged in the village since 1990. The concerts are held in castles, churches and other exceptional locations. The town of Lessines (12km from Silly), with its famous Notre Dame à La Rose hospital dating back to 1242, is an unmissable destination. This medieval building is often compared to the Hospices de Beaune in France and has been a protected heritage site since 1940. 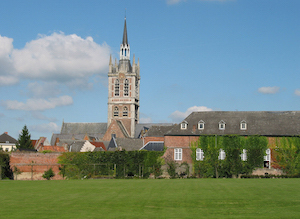 Notre Dame à La Rose, straddling the River Dender (Dendre) is one of the last remaining medieval hospital sites, with a nunnery-hospital located in the main building on the left bank, a farm on the right bank, gardens, an ice chamber and a riverside cemetery. 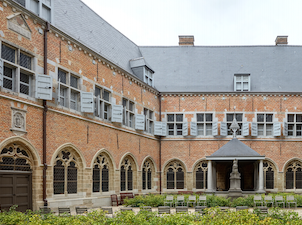 The buildings, constructed in a mixture of Gothic, Baroque and Renaissance styles, form a harmonious quadrangle around the nunnery and courtyard. The medieval town of Edingen gives its name to Silly’s Enghien beer and lies 10km away from the brewery. 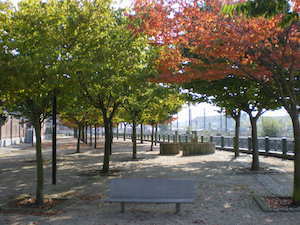 The town offers plenty of cultural and architectural gems. The splendid public park covers 182 hectares and was established by the Arenberg family in 1630. There is plenty to see: a flower garden, a rosarium, a triumphal arch, Empain Castle, the Seven Stars pavilion, to name but a few. In the town itself you can amble through alleyways flanked by 16th and 17th century cottages. At the Grote Markt, the main market square, you will find the Gothic Church of Saint-Nicholas with its carillon (or belfry) dating back to 1512. The Jonathan House, a former guard tower, now houses an extensive collection of tapestries from the 15th and 16th centuries that bear witness to the former riches of this town. Ath, 13km from Silly, is known for its annual Ducasse ‘parade of giants’ held on the fourth Sunday in August. The town has a rich architecture and history to explore all year round. The Tour Burbant (Burbant Tower) was built in the 12th century during the reign of Baldwin IV, Count of Hainaut and is protected as a piece of exceptional Walloon heritage. The 17th-century Town Hall on the main market square regularly hosts temporary exhibitions. It also houses the permanent collections of the National Balle Pelote Museum. Called kaatssp’ in Flemish, this ancient ball game, a relative of the Spanish game pelota, is a local speciality. In Brugelette, 9km away from Silly, amongst the ruins of the former Cistercian abbey in Cambron, you will find the Pairi Daiza, (ancient Persian for ‘enclosed garden’), an exceptional garden covering 55 hectares. 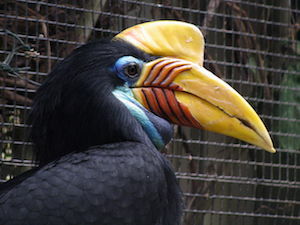 It is home to a large number of exotic animals living amongst ancient trees, flowers and plants from across the globe and architecture from China, Indonesia and Thailand. Each year, Pairi Daiza attracts over one million visitors. 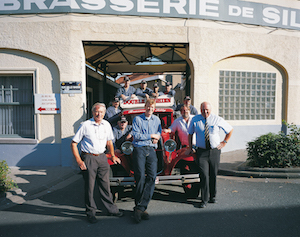 Brasserie de Silly offers tours to groups of at least 15 people by appointment. During your visit you will discover the entire production process, from brewing to bottling. And, of course, visitors can enjoy tasting the Silly craft beers at the end of their tour.